English authoress and communal worker; born at Portsmouth May 2, 1844; daughter of E. Emanuel; wife of Sir Philip Magnus. She has been connected with various committees of the Berkeley Street Synagogue, has taken a great interest in the Jews' Deaf and Dumb Home, and is treasurer of the Jewish Girls' Club. 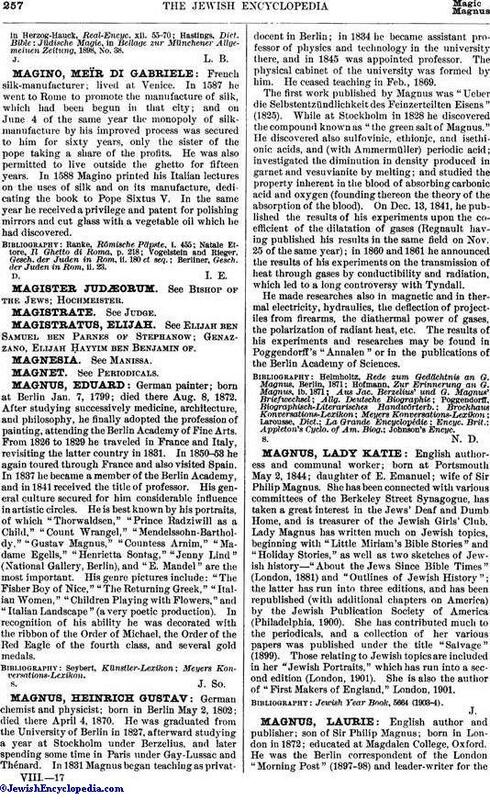 Lady Magnus has written much on Jewish topics, beginning with "Little Miriam's Bible Stories" and "Holiday Stories," as well as two sketches of Jewish history—"About the Jews Since Bible Times" (London, 1881) and "Outlines of Jewish History"; the latter has run into three editions, and has been republished (with additional chapters on America) by the Jewish Publication Society of America (Philadelphia, 1900). She has contributed much to the periodicals, and a collection of her various papers was published under the title "Salvage" (1899). Those relating to Jewish topics are included in her "Jewish Portraits," which has run into a second edition (London, 1901). She is also the author of "First Makers of England," London, 1901. Jewish Year Book, 5664 (1903-4).